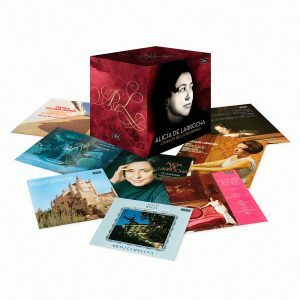 Limited edition 41-CD set presenting Alicia de Larrocha’s complete Decca & American Decca recordings, including previously unreleased recordings of Grieg and Albéniz. Includes 2 discs of bonus material: 2 CDs of de Larrocha’s early Hispavox (EMI/Warner) Madrid recordings of piano encores. Includes recordings with Pilar Lorengar, Rafael Frühbeck de Burgos, André Previn, Sir Georg Solti, Riccardo Chailly, Zubin Mehta and David Zinman. The music of Spain is central to this collection, and de Larrocha’s interpretations and characterizations brought new meaning and importance to these works and remain the gold standard – highlights include: Falla’s Nights in the Gardens of Spain, Albéniz’s Ibéria, and Granados’s Goyescas. When it came to 19th-century virtuoso fare, key corners of the French repertoire, and the Russian Romantics, de Larrocha positively flourished: the Khachaturian Concerto; Rachmaninov’s Second and Third Concertos; Franck’s Symphonic Variations; Ravel’s Concerto, Grieg’s Piano Sonata (previously unreleased), Mendelssohn’s Variations. Larrocha’s Schumann playing is fluent and poetic; notice, for example, the Concerto, Kreisleriana, Faschingsschwank aus Wien, the C major Fantasy, the F sharp Novelette, plus both analogue and digital versions of the rarely heard B minor Allegro and the perpetually popular Carnaval. Greatly respected by her peers, not least Arthur Rubinstein, Gina Bachauer, Van Cliburn, Claudio Arrau and Vladimir Horowitz, if you wanted to witness a Who’s Who of New York City-based keyboard luminaries gathered in one place, you simply had to purchase a ticket for an Alicia de Larrocha recital. Slight of frame, de Larrocha’s physical stature belied her considerable accomplishments, not least in key corners of the French repertoire and the Russian Romantics where she positively flourished and we marvel at the pianist’s tiny hands effortlessly traversing huge leaps on the keyboard and summoning colossal sonorities that never splinter. Born in Barcelona on 23 May 1923. Alicia de Larrocha came from a musical family. Both her mother and her aunt were disciples of the composer and pianist Enrique Granados. Alicia began lessons at the age of three with Granados’s student and teaching assistant, Frank Marshall, who insisted that his gifted student gain a solid foundation in Bach, Haydn, Mozart, Beethoven and Chopin, which, in turn, helped to inform what would become her standard-setting interpretations of Spanish music. She explained in a 1973 Gramophone interview “if you can’t play Bach correctly, you can’t play Spanish music”. Her first American recitals in 1954 and 1955 coincided with her first major label recordings, made in New York for American Decca, all reissued as part of the present collection. Though she broached the recording process reluctantly, she nonetheless recorded a large discography and it was her association with British Decca between 1970 and 1988 that was to be her longest and most fruitful major label relationship.